“BFF: Best Friends Forever” by Suzanne Wolfe was the winner of the SCWS Past Presidents award. The Hartsville Museum recently hosted the 38th annual exhibition of the South Carolina Watermedia Society. Originally 222 works were submitted by 122 artists. From these, juror Kristin Casaletto selected 71 pieces to be juried into the show. The top 30 award winners comprise the 2015/2016 SC State Museum’s Traveling show. Since 1977 the South Carolina Watermedia Society has been promoting the artistic and professional interests of its members while also providing visual arts programs to the public. The Watermedia Society makes the accomplishments of its members available to a broad spectrum of SC citizens. Marketing the original works of SC artists, SCWS is the largest statewide visual arts group. Membership is open to any artist who lives or owns property in SC, NC, or GA. Public outreach and educational programs are supported. “Wash Day” by Becky Hollingsworth was voted Best of Show. 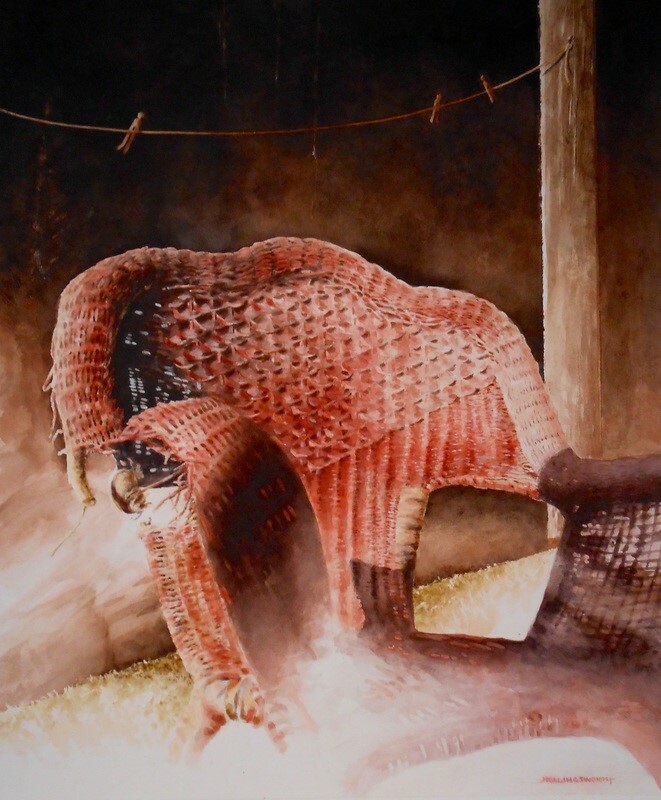 “Barnyard Stomp”, a watercolor on yupo prepared by Brenda Lawson, was also an award winner. Artist Barbara Rohde of Durham, NC stopped by the Hartsville Museum to observe her painting “Gossip”. This work is transparent watercolor on paper and received the Supporters of Artists (SOA) Award.